These are actually really easy to make, they require a few steps but it goes pretty fast. It’s worth the extra steps, I promise. Whatever you do though, don’t leave off the maraschino cherries. It’s just wouldn’t be the same without them. You can usually find the cherries either by the canned fruit at the grocery store or buy the ice cream cones. My kids go crazy for the things (oh, and me too). I have to hide them when I buy them or it’s like the first thing they ask for every day. Smart kids, I mean how could your day go wrong when you start it out with a maraschino cherry? The finer things in life. Preheat oven to 350 degrees. Spray 12 muffin cups well with non-stick cooking spray. Drain both cans of the pineapple chunks while reserving 1/2 cup of the juice for batter. Place pineapple over several layers of paper towels to drain well. Melt butter in a microwave safe bowl then stir brown sugar into melted butter. Divide mixture among muffin wells, adding about 2 tsp to each. Arrange pineapple chunks on top of the sugar mixture, about 5 in each (you may not use all of them but I found one 20 oz can wasn’t quite enough so I ended up opening 2 cans. The pineapple may be too long to make a flower shape but try to squeeze in 5 of them unless they are large chunks). Set aside. In the bowl of an electric stand mixer whisk together flour, 3/4 cup sugar, baking powder and salt. Set mixer with a paddle attachment, add butter and pineapple juice then mix until batter is smooth, about 1 – 2 minutes (if using a paddle attachment that doesn’t constantly scrape bowl, then occasionally stop mixer and scrape down sides and bottom of bowl throughout mixing process). Mix in egg and vanilla extract until well combined. Divide batter evenly among muffin cups, layering batter over pineapple layer. Bake in preheated oven until toothpick inserted into into center of cupcake comes out clean, about 23 – 26 minutes. Remove from oven and allow to cool 5 minutes, then run a sharp knife around edges to loosen. Place a wire cooling rack over top of muffin pan and flip to invert onto wire rack. 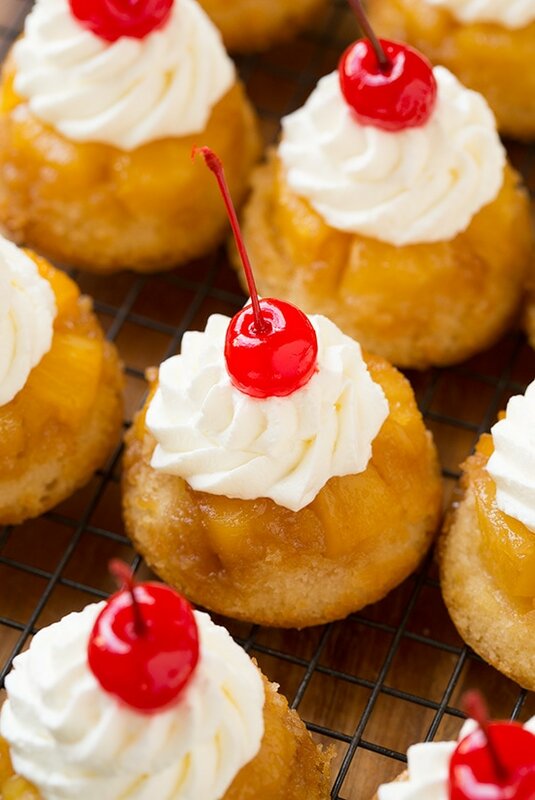 Let cool completely then pipe sweetened whipped cream over cupcakes just before serving and top with a maraschino cherry. 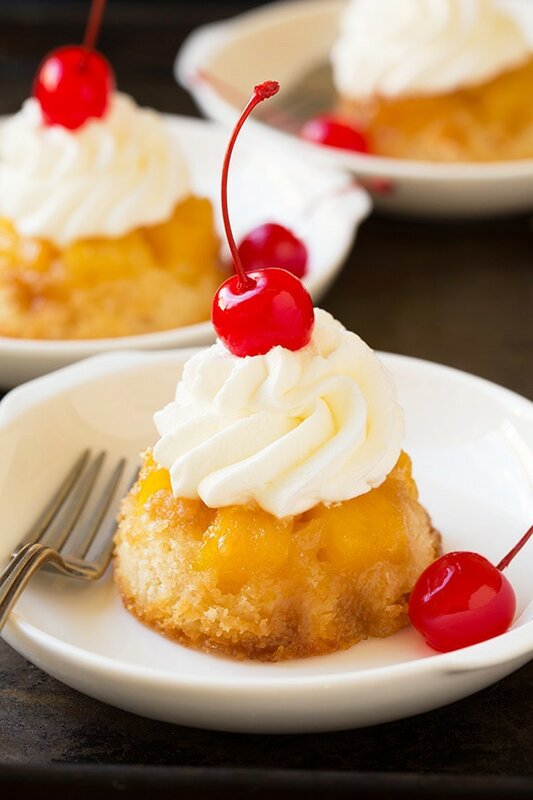 In a mixing bowl using an electric hand mixer (or in a clean stand mixing bowl set with whisk attachment), whip cream on high speed until soft peaks form. Add sugar then whip until stiff peaks form.